[T]hose keeping faith in recovery also point to the fact that the yield curve has not inverted – 10-year bonds still yield 2 percentage points more than two-year bonds. Given that the 10-year yield has dropped below the two-year (and the three-month) before every recession since the second world war, perhaps a double dip is not looming. Unfortunately, a quick glance at Japan suggests that once short-term rates hit the floor, the yield curve may no longer be a valuable indicator. While it warned of the recession that followed the bursting of Japan’s bubble, it missed the three recessions since. Worries about a double-dip recession have spawned much economic commentary … and a humorous country and western song. So how likely is a return to recession? Researchers at the San Francisco Fed took a crack at this question a few weeks ago. Their answer? It depends. When they used a traditional model based on the leading economic indicators, the probability of a second dip turned out to be about 25% over the next two years (the blue line). When they dropped one indicator from their model, that probability doubled to about 50% (the red line). That important indicator is the yield spread–the difference between the 10-year Treasury interest rate and federal funds rate. In recent decades, the yield spread has done a terrific job at anticipating recessions. When the federal funds rate has risen above the 10-year rate, the economy has invariably fallen into recession. As I noted briefly the other day, the relative steepness of today’s yield curve (10-year rate about 2.5 percentage points above the fed funds rate) thus suggests, by itself, that renewed recession is unlikely, despite recent weak economic data. On the other hand, there are reasons to believe that this time things are different (usually a scary phrase). After all, fed funds rate has been pushed down almost to zero and yet the economy no longer appears to be responding. That’s exactly the logic that inspired the SF Fed researchers to try their model without the yield spread. The Bureau of Economic Analysis rewrote history on Friday. 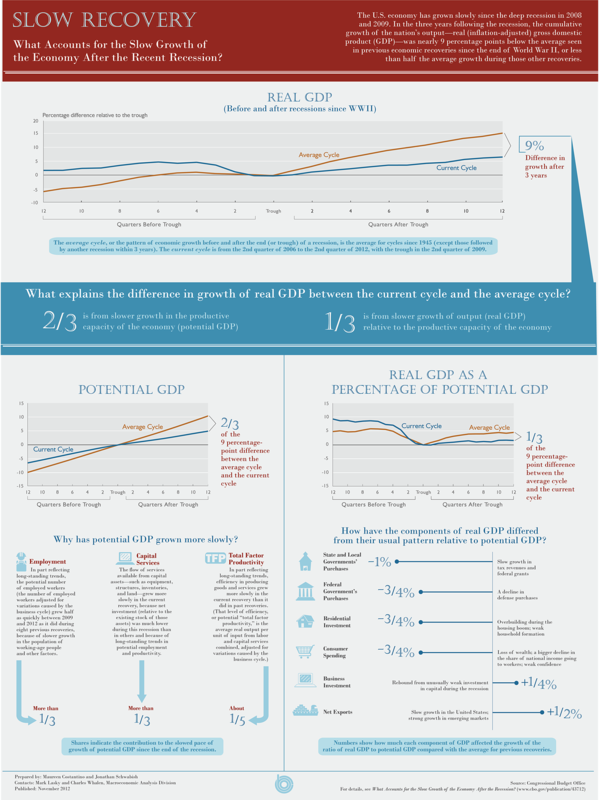 Along with GDP data for the second quarter, BEA also published revisions to its GDP estimates since the start of 2007. 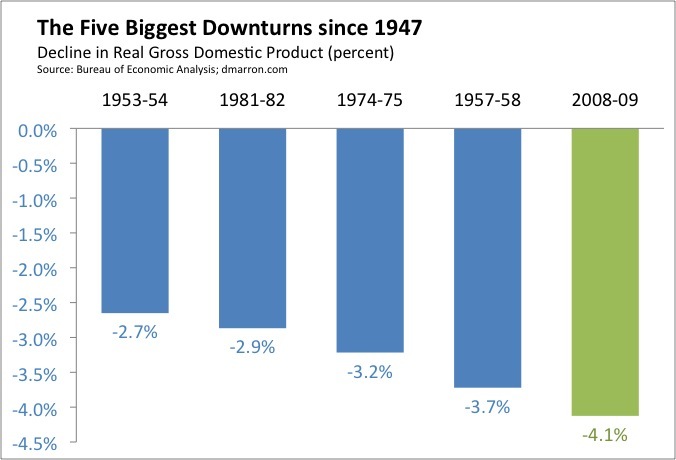 Bottom line: The recession was worse than originally thought. The economy contracted by 4.1% from peak to trough (Q2 2008 to Q2 2009), up from the 3.9% previously estimated. 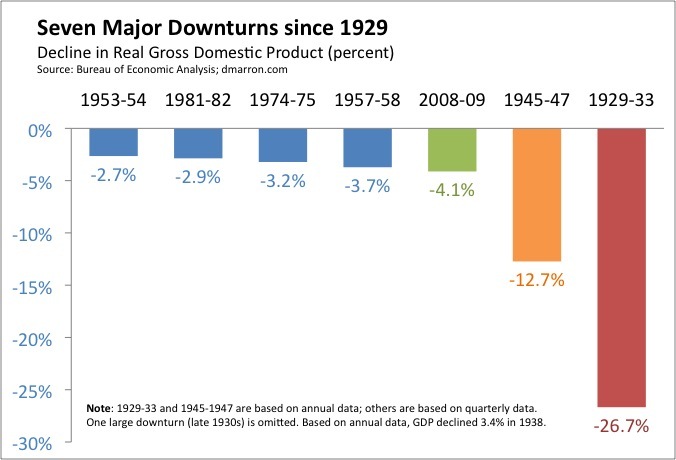 Which raises an important question: Just how close did the Great Recession get to being the Great Depression 2.0? Mark Zandi and Alan Blinder took a crack at that question in a paper released last week. Their answer: If it weren’t for aggressive monetary and fiscal policy responses, the U.S. economy would have contracted more than 12% during 2008, 2009, and 2010 — about half a Great Depression (and arithmetically, but not economically, comparable to the demobilization after WW II). That argument contains an element of truth: many foreclosed homeowners do indeed become renters (some even become homeowners again). But I’ve always wondered how many former homeowners follow a different path and instead move in with their parents, friends, or roommates, rather than getting their own place to live. Similarly, I’ve wondered how many young adults have delayed starting their own households and instead have stayed at home longer. On Wednesday, the Mortgage Bankers Association released a study by Gary Painter (sponsored by the Research Institute for Housing America) that examines this question. His answer? 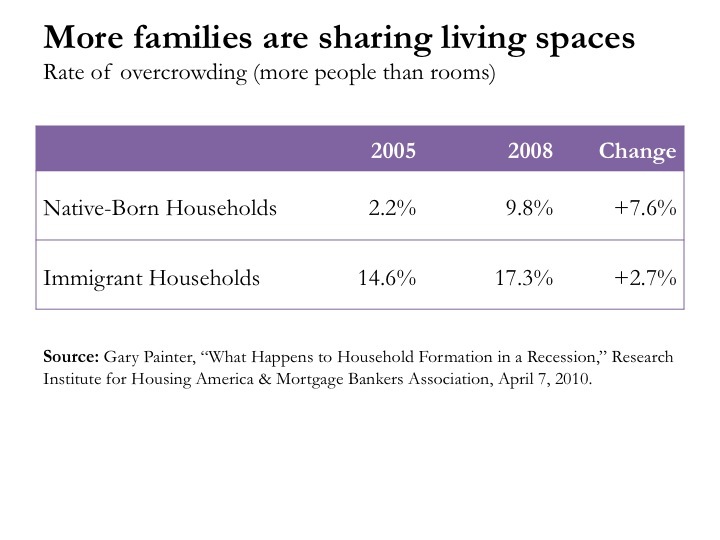 America lost 1.2 million households from 2005 to 2008, despite ongoing population increases. Oh, and we likely lost even more households in 2009. Needless to say, that retrenchment contributes to the ongoing overhang of vacant homes and rental properties. P.S. A related issue is the extent to which people have become homeless, rather than moving in with others. I didn’t find a clear answer in some quick searches, but the National Coalition for the Homeless has a useful discussion. Earlier today, the Federal Reserve released its latest data on industrial production. Bottom line: production over the past three months has been surprisingly strong. Growth in September was more than expected, and the previous month was revised upward. As you can see, manufacturing production turned consistently negative in January of 2008 and then fell off a cliff toward the end of the year. After declining in 17 of 18 months (driving manufacturing production down a total of 17%), manufacturing production has now risen for three straight months (for a cumulative rebound of about 3%). How Much Did Cash-for-Clunkers Boost Auto Sales? The state assistance in the stimulus act. Stimulus efforts in other countries. I suspect that other bloggers (not to mention the regular media) will have lots to say on the stimulus analyses, so I started my reading with the clunkers piece, which I found quite interesting. What about the other 360,000?